Today's TV can feel overcast with dark, gritty tales of murder and violence on the streets. Real life, meanwhile, is wracked with anxiety over the B-word. Some though are finding an antidote in a BBC home improvement show. For the uninitiated, DIY SOS is less about hammers and plywood, and more about families, community, and ultimately love. Presenter Nick Knowles, his team, and hundreds of local volunteers spend nine days rebuilding the home and garden of a family in need, before a climactic big reveal when only the most stone-hearted of viewers can hold back the tears. 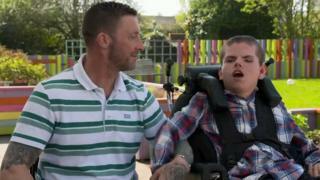 We meet Darren and his three sons, one of whom is severely disabled. Darren is in a wheelchair following paralysis from a rare syndrome. Unable to get up the stairs, he's been sharing a downstairs bedroom with his son at their home in Hull. The four have been living in emotional trauma since the sudden death of Sarah - Darren's wife and the boys' mother. For some viewers, it was enough just to hear their circumstances for the tears to come and their own troubles to be put into perspective. During the 60-minute programme, viewers watched the team build a two-storey extension, new bedrooms, a lift, hydrotherapy unit and an accessible kitchen. Darren and his boys' story, which went out at 9pm, was watched by 3 million people. But those aren't the biggest figures by a long stretch. In 2015, an episode centring on a village for armed forces veterans had 9.6 million people reaching for the tissues. And the team, with some royal assistance from the Duke of Cambridge, have also built a community centre and boxing club on the site of the devastating 2017 fire at Grenfell Tower. After the 96-day build, Knowles told the Mirror it was not a jump-up-and-down moment. The buildings weren't going to take away the pain but they gave them the facilities to rebuild the community, he said. The show, which first launched in 1999, had its own makeover in 2010. It went from sending in the professionals to fix a DIY mess to more ambitious projects, under a new name DIY SOS: The Big Build. Only people needing - not just wanting - large structural home improvements are considered for the show. And all the extra helpers, many of them professionals working for free, are local - thereby turning the spotlight on cities and towns which often don't make it onto our screens. It seems to be a formula that gives the show "more emotional heft than almost anything else" on the box, according to TV reviewer Stuart Heritage. "People don't watch DIY SOS to be surprised. In fact, they barely even watch it at all," he writes. "It's more the case that they simply strap themselves in and allow themselves to be emotionally manipulated to within an inch of their lives for an hour. "DIY SOS is exhausting. It's ridiculous," he says. The Times TV reviewer Carol Midgley, who gave Darren's story four stars, says anyone who can manage to be cynical about that episode of DIY SOS "must not have a heart, but a big swinging brick". "Here was tragedy soothed by community and compassion. It was reality TV as a force for good, and you can't say that very often," she writes. Twitter on Wednesday night was awash with people humbled, inspired, moved to tears and, despite everything else going on right now, declaring their faith in humanity had been restored. #DIYSOS is the only thing that restores my faith in humanity. What a fantastic effort by all for a family that got dealt such a bad hand in life. Great episode!